Washington Apple Pi "Mini Meetings"
Apple Pi Mini-meetings: Tysons Corner Apple Store, March 15, 10:30-11:30 a.m.: Living the iLife Life - Making movies without a camcorder. Apple Pi Mini-meetings: Tysons Corner Apple Store, April 19, 10:30-11:30 a.m.: Living the iLife Life - What a difference the soundtrack makes. 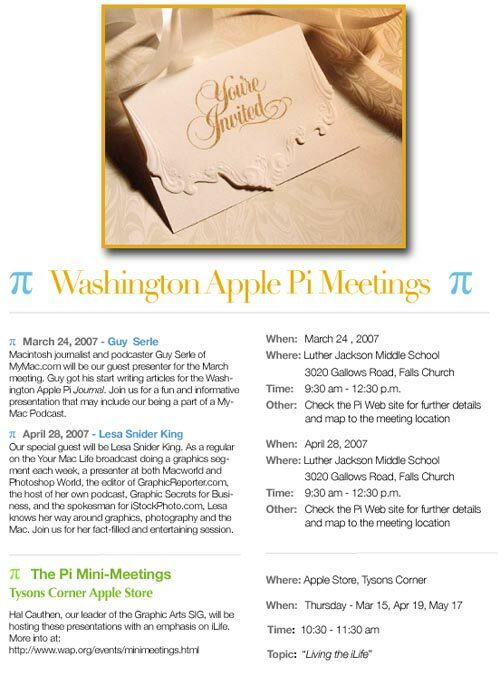 Apple Pi Mini-meetings: Tysons Corner Apple Store, May 17, 10:30-11:30 a.m.: Living the iLife Life - iMovie and iPhoto compared. If you have Mac OS X 10.4 (and if you don't, why don't you?) the quick way to know what is happening at the Apple Store on any day or week is to use the Apple Store Events widget. Click on Dashboard in the Dock and view today's or this week's events. The "workshops" and "special events" are focused mini-meetings, helping Macintosh users learn and ask questions in hour or hour-and-a-half sessions. To get the widget, click on the image below and install as you would any other widget.